Once in a while you just have to leave hot, humid Florida and escape to a cooler climate. A fall trip to Maine, New Hampshire and Massachusetts was on this gardener?s schedule to find the moderating temperature and check the northern plantings. He was not disappointed with temperatures in the 60's for most of five days and plenty of color. Cooler weather brings out the fall color in northern landscapes. There were asters, goldenrod, zinnias, marigolds and salvia in bloom to enjoy in most flower gardens. The coleus was also giving its final display of the year before frosts and freezes. And then the maple, ash and sumac trees were displaying their yellow, orange and red leaf colors of fall. Gardens were about done with planters picking their last tomatoes, squash and cucumbers. One gardener did note he grew the largest pepper ever this year but the crop was now about gone. Some still had plenty of greens planted which could be harvested until the really cold weather. A few gardeners were putting their plots to bed by clearing their sites. These will rest until the next spring planting of late April or May. One real treat is the gardens at Prescott Park. This is where All America Selection flowers are on display. 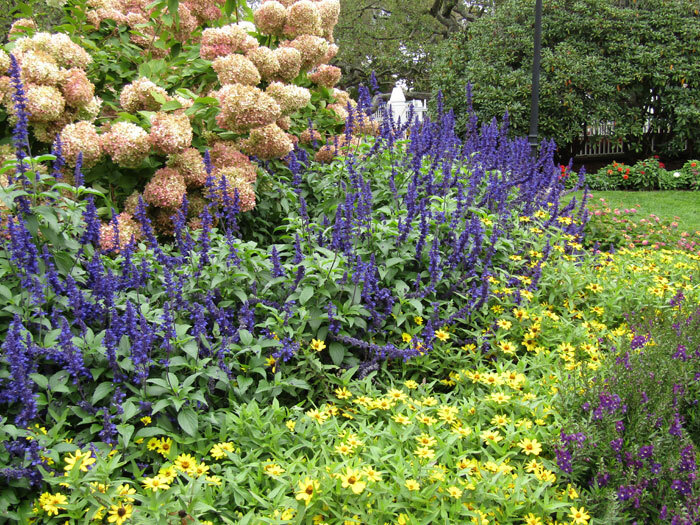 The beds were still colorful with angelonia, marigolds, asters, salvia, zinnias, coleus and more of the Selections. The hostas were fading fast as were many of the shorter lived annuals. One shrub of note was the snowball hydrangea now turning pink as the plants head into the cooler months. It appeared fall had arrived earlier than normal but there was plenty to see. Always a favorite stop is the Fryeburg Fair with plenty of animals and agricultural produce. This year the pumpkins were a bit of a disappointment with the largest only weighing in at 292 pounds. These big ones never look like the typical pumpkins but are more big squashes. Many vegetables were on display as was honey and forest products like maple syrup. There were plenty of animals of all types but few old tractors. A trip north gives us heat relief and also a chance to visit with other gardens as they complete a year?s worth of plantings and bring in the harvests until next spring.